We have wanted an antique log cabin for years. But it is almost impossible to find one for sale. My husband has worked in construction for more than 30 years. I have an antique shop and also sell outdoor concrete statuary and fountains. A few years ago when work was slow in the winter I would ask my husband, "What are you thinking?" He would say, "Ah...nothing much." You know what I mean don'cha girls? Well it turns out he was thinking about that log cabin I wanted. A year before we had purchased an old log barn which we disassembled and moved to our retail location. Not long after, we purchased some old square hand hewed logs with dovetailed corners. My husband began making molds of these old logs using latex rubber to capture all the details of the wood logs. He then poured concrete into the molds to create concrete log siding. Then he built a 20' x 30' cabin using frame construction, and put the concrete log siding on the cabin. When all the logs were installed he stained the concrete log siding with concrete acid stain. Next he filled the chinking with mortar. Folks driving down the road believe they are looking at an authentic old log cabin. Even on closer inspection many still argue that it is a wood log cabin. I just found out about the concrete logs. Did they originate from Montana? Do we have access to a company here in Arizona? Your cabin looks like real wood! It's beautiful! Is it expensive? Thank You for sharing a picture of your cabin. I'm coming over to the cabin the next tornado warning! I can't imagine how secure it would feel in a concrete house....all the while feeling very 'rustic' in my surroundings! What a great idea, I hope you make millions! Yes Molly, the molds are reusable. And we do think that it's a good business idea and have filed for a patent. We recently won a state-wide business plan competition which encouraged us to move forward with this idea. You mentioned that your husband made latex molds of the logs. Are these re-useable? It seems like this could be a good business making concrete logs or log siding using the molds. Your cabin looks very nice, by the way. Maintenance is extremely minimal. It will not rot as real wood logs do. Insects such as carpenter bees and termites do not feed on concrete. Also, it is very "Green" as no pesticides harmful to the environment need be used. And no natural resources (trees and forests) are depleted. I can't believe that's concrete -- it looks just like a real log cabin. I guess it will withstand any storm, too. Any maintenance issues with the concrete? Join in and write your own page! It's easy to do. How? 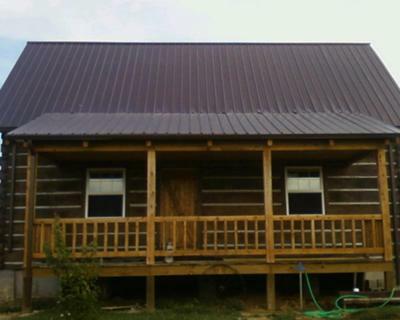 Simply click here to return to Log Cabin Articles and Stories.